50% of men suffer from male pattern baldness by the age of 50. It is a common condition- so we are going to explain what you need to know about male hair loss in this blog. Also known as androgenic alopecia and genetic hair loss, male pattern baldness is a genetic condition that you inherit from your mum and dad. This should hopefully dispel any myths around hair loss being inherited primarily by genes passed down from your mother! Male pattern baldness is called a “pattern baldness” because it typically occurs in a predictable pattern. A by-product of Testosterone called Dihydrotestosterone (DHT) causes the hair loss by making the hair smaller and fall out over a shorter period of time. The DHT predictably acts in a certain pattern hence the name “male pattern baldness”. It is so predictable that you can even classify different stages of how severe your hair loss by the pattern of your balding. DHT does not affect the hair at the sides and the back of your head. This is why you often see old gentlemen who still have hair on the sides and back but none on the top. A name is given to these different stages- it’s called the Norwood Scale (picture below). You might even be able to tell which stage you are at. If you suffer from male pattern baldness over a period of time, you can see from the picture above that you will eventually become bald (Norwood 6 or 7). Are you worried you are losing your hair? After combing your hair, collect any hairs on the brush or on the floor in a bag. Do this for 14 days. If the average number of hairs you collect over 14 days is more than 100 hairs per day this could also be a sign of hair loss. Sometimes you may realise you are losing your hair when looking at old pictures of yourself. Some of your loved ones may even comment on the fact that your hair is thinning or receding. In these instances you are probably having less obvious hair loss that is happening slowly. How do I stop any more hair loss? Do I want hair back in completely bald areas of my head? One of the first steps you must take to address both questions is booking in to see a hair loss specialist- like one of the surgeons here at The Treatment Rooms London. With many different treatments out there, you must choose your treatment carefully. Our advice is to stick to treatments that are tried and tested with proven clinical benefit (approved by the MHRA and FDA). To stop any more hair loss you need to stop the DHT acting on your hair in your head. This can be done by taking a medication called Finasteride (a DHT- receptor blocker). This helps to stop any more hair loss and promote healthy thick hair growth. By taking this medication you essentially freeze frame your current hair loss pattern and give yourself a chance to thicken your hair (as the hair is no longer being miniaturised by DHT). You can also take Minoxidil, which is a shampoo or spray you apply to the top of your head. Minoxidil helps to increase blood supply, nutrients and oxygen to the hair follicles. It therefore helps to grow thick hair on your head. Other treatment options include Laser devices and PRP injections which can help thicken hair but do not always work for everyone. If you want hair back where you no longer have it then a hair transplant may be the best treatment option for you. A hair transplant uses hairs that are not affected by DHT (hair on the sides and back) and transfers those hairs to areas you have become bald in. These hairs remain resistant to DHT and so they don’t shrink and fall out over time. This means a hair transplant gives you a new hairstyle for life- reversing any hair loss that has already happened. At The Treatment Rooms we find a combination of medical treatments like Finasteride and Hair Transplant surgery is the best option for male hair loss sufferers. Will I go completely bald? If you are suffering from male pattern baldness then the likelihood of going completely bald without having treatment depends on a few factors. For men who have aggressive hair loss and have receded quickly over a short period of time (e.g. receding to Norwood 3 or 4 by mid 20s) then you may become completely bald at an early age. Sometimes you may only notice hair thinning and recession when you get to your 30s or 40s. This means you have a slower form of male pattern baldness and it is unlikely you will go completely bald anytime soon. To have an idea of whether you will go completely bald take note of when you started to have hair loss and how quickly you have thinned or receded. By seeing a hair loss specialist you may be able to start treatments that prevent any further hair loss and promote new thick hair growth. When should you decide to treat hair loss? The answer to this is really dependant on you. If you don’t mind being bald and want to sport the “Jason Statham” or “The Rock, Dwayne Johnson” look then you can certainly choose not to have treatment. For those who would like to keep hair on their head that they can style then you should look to get in contact with our hair loss surgeons and specialists as soon as you can. The more hair you have lost the more difficult it becomes to give you your hair back. You can book a consultation with our surgeons by clicking here. With male pattern baldness you may find you fit a particular type of balding pattern. 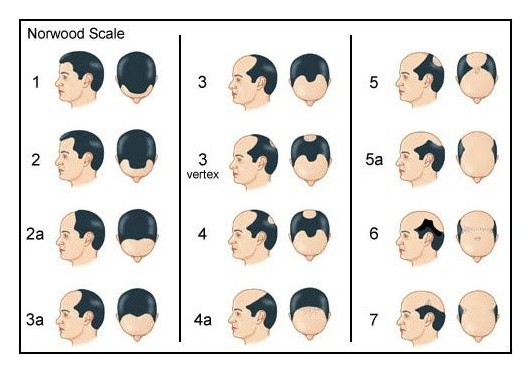 You can compare your existing hair loss pattern to the Norwood Scale or you can look at some of the pictures below which will likely match your hair loss pattern too. A receding hairline can leave you with a “widow’s peak”. Hair is lost at the temples and you recede backwards. This can progress to meet some thinning and hair loss at the crown too. If the hair recedes too far then this will leave you bald at the front. Thinning at the crown can happen together with a receding hairline. Initially the crown hair starts thinning before falling out and leaving you with a completely bald crown where your scalp can be visible. Sometimes you may notice your hair is becoming thin all over and your hairline doesn’t recede. It can be difficult to initially notice you are losing hair as generalised hair thinning can be slow. This is where you develop small bald patches in your hair. It happens because your body’s immune system is overreacting to its own follicles making them thin. Eventually they will fall out. Alopecia areata can also be treated but it is important you see a hair loss specialist to get a diagnosis and a management plan.